Juste obtenir ici comme vous le pouvez !! Vous ne le regretterez pas! Venez profiter de l'hospitalité de l'île de votre maison de vacances. Pieds sans fin de l'océan façade sur dix acres, tout pour vous de profiter. Oceanviews et couchers de soleil magnifiques sont une image parfaite. Il ne peut pas faire mieux !! Quarante-cinq pieds à quelques pas de l'eau. Profitez de la vue sur l'eau depuis votre salon (plafonds 25 '), salle à manger, cuisine, mezzanine et chambre à coucher. La chambre côté océan offre des vues spectaculaires, porte coulissante en verre menant à la terrasse. Il est le vôtre à avoir. Tout ce que vous avez besoin est ici vous attend dans ce nouveau chalet avec toutes les commodités. Vous êtes idéalement situé pour les attractions sans fin et la ville de Summerside, qui vous offre tout ce dont vous avez besoin pour faire de votre séjour un moment privilégié. Vous pouvez golf, natation, vélo, pêche, boutique, dîner, ou vous détendre et ne rien faire, mais se détendre. Venez ici pour obtenir loin de tout. Ne tardez pas, faites votre réservation dès aujourd'hui. Votre île vous attend! Our stay was lovely....the views are incredible. The chalet is lovely, so comfortable, and nicely equipped. The weather was cool and windy, and the few times it showered, we saw rainbows. The location is perfect; Summerside was an easy trip for supplies, and Charlottetown was a fun side trip. Our golden retriever enjoyed long walks on the beach, and sunny afternoons by the sliders. The owner Robin was wonderful to deal with and very prompt with responses. We have done VRBO rentals in the past, and this was so nice from start to finish. If you are looking for a relaxing private getaway - here is the answer. We had not been to PEI for over 27 years and I was excited to find such a great looking cottage online. The cottage did not disappoint. It is as gorgeous as the pictures show. We arrived from Alberta just at sunset and witnessed the gorgeous sunset from the deck before we were able to go and get groceries for the week. The cottage was clean and ready when we arrived. The property has lots of grass and the other cottages were rented when we were there, but there is so much room that we didn't notice the other guests. Great for families with small kids, but also great for adults. We had six adults in our group and everyone had a great time from the hot tub, to relaxing on the deck to walks on the beach. It was wonderful to have satellite TV and internet for the couple of rainy days that we had. It is amazing how far you can walk at low tide. Robin the owner is wonderful to work with and had all of the paperwork organized before we got there. We had lots of phone numbers if we needed them for the caretaker if we needed anything during our stay. We highly recommend this place. If you are a larger group, or grandparents who want to travel with their children and grandchildren, or 2 grown siblings and their families, consider renting both cottages. A great way to vacation together, but not in the same cottage. We will certainly rent this again the next time we are out to PEI. My husband and I enjoyed a week this summer at the chalet with our 4 sons. It was an amazing holiday and exactly as represented in the ads. The sunsets were beautiful and the water was incredibly warm. We loved that you could walk forever along the shoreline and that you could wade out for a long ways in the water. My boys loved digging for clams at low tide and watching the hermit crabs. It was extremely private, quiet and relaxing to lounge on the deck and enjoy the fabulous view. Definitely our favourite vacation spot to date and well worth the trip! I would recommend it to anyone wanting a getaway free of crowds, whether as a couple or a family. An ideal place for families with young children. Family time, at it's best!!! Great place to spend your family vacation. The views are fantastic! When you look out the floor to ceiling windows, all you see is the blue water. No obstructions. Sunsets are absolutely the best!! Watching the sunset from your gigantic deck while enjoying your BBQ and beverages, doesn't get any better. Robin, the owner, is pleasure to deal with. Very informative and available. The chalet was very clean and comfortable. The living room has cathedral ceiling finished with pine. Very comfortable with lots of seating. The living room is open to the dining area and the kitchen, which is fully equipped. The water's edge is right in front. Great place for children . It has a very gradual tide. Kids can play for miles and comb the beach. Looking forward to more vacations at BLUE SEAS CHALET!! Coming here to review this property and flipping through the pictures makes me miss it oh so much. Pictures are a perfect representation of what your getting. This was my families second year at Blue Seas, it is our hidden little sanctuary on the island. It is very private, beautiful! There is beach to wander and explore forever, The kids love playing on the sandbars and finding shells and hermit crabs. Also the perfect spot for kite flying! Sunsets are incredible! The owner Robin is a delight to do buisness with, willing to go out of her way to make your stay perfect with a simple call or email. My family and I will be making this our annual retreat for as long as possible! 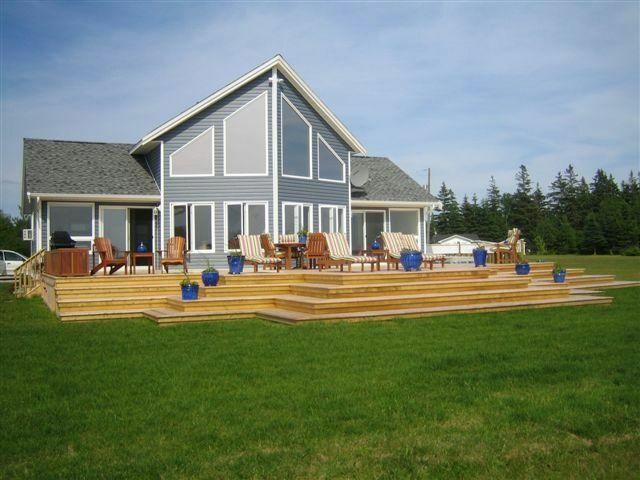 Having vacationed in pei for the last four years, and having stayed at this villa for the last two summers, i will look no further for our ultimate vacation spot. The pictures don't do it justice. We wake to the sound of waves and have breakfast on the totally private, expansive deck that is just metres away from the shore. As we watch the tide slowly recede, we then go out to beach comb and search for ocean treasures on the ocean floor, going endlessly in either direction. When we leave to sight see, we make sure we always make it back for late afternoon surf and turf dinners on the deck. Then it is beach combing again, as the tide recedes yet again. The night ends with our nightly hot tub on the deck, as we watch the fabulous sunsets! Everything is on hand, even the lawn games to play on the amazing front lawn. The caretaker is minutes away, should you need anything, and Summerside is just a few miles away, with great sea food shops! Clean, tastefully decorated, and so easy to get from the villa to anywhere on the island. Will be back for more, for sure! Ce chalet est sur le détroit de Northumberland. La marée est très progressive et l'eau est chaude. Vous pouvez vous promener sur les barres de sable rouge sur des kilomètres et des kilomètres. Prends une pelle et vas-y. Emmenez-les à la maison et faites-les cuire! Des kilomètres infinis de façade d'eau pour que vous puissiez en profiter !!! Les couchers de soleil sont exceptionnels. Près de la ville pittoresque de Summerside qui a tous vos besoins et plus (restaurants, cinéma en direct, cinéma, trois marchés, Walmart, pneus canadiens et plus). Spinnaker's Landing (situé à Summerside) offre des concerts gratuits et des achats touristiques. Beaucoup d'autres attractions touristiques vous entourent.